I have met lots of people since arriving in Hong Kong in July. Many are mums and helpers (maids) from Abbey's kinder or Zoe's playgroup. Often I will chat with other parents and helpers at the local playgrounds, of which there are many close to our apartment. In all of this, I have made one true friend (so far), one person I have really made a connection with. We have many things in common, she loves exploring Hong Kong as much as I do and we parent in very similar ways. Both our big girls go to kinder together and love playing with each other, and our toddlers get along really well too. She is also crafty - she makes cards and does beautiful scrap-booking. Look what she has lent me this week, to have a play with. Oh boy, did I have some fun last night with her paper punches! Like I needed another crafty hobby. 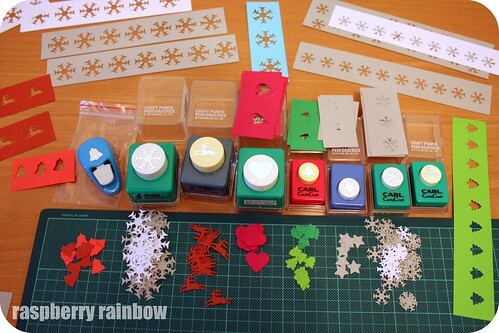 I am now hooked, and want to start my own paper punch collection. Today when Zoe sleeps, I will put some music on, make a cup of tea, sit down and make some Christmas gift tags with all my paper punchy lovelies. Pop in and see what all the Creative peeps are up to today. Lucky you! Have fun with them. The 'holes' are just as pretty as the cutouts! You'll have wonderful gift tags this year. It's lovely that you have found someone lovely to call a friend, it's important to have someone to call when you need a chat. WARNING: Paper craft (especially punching) is hideously addictive. I now have a sewing machine gathering much dust thanks to the instant gratification of paper punches (but perhaps that says more about me than anything else...). But yes, fun!